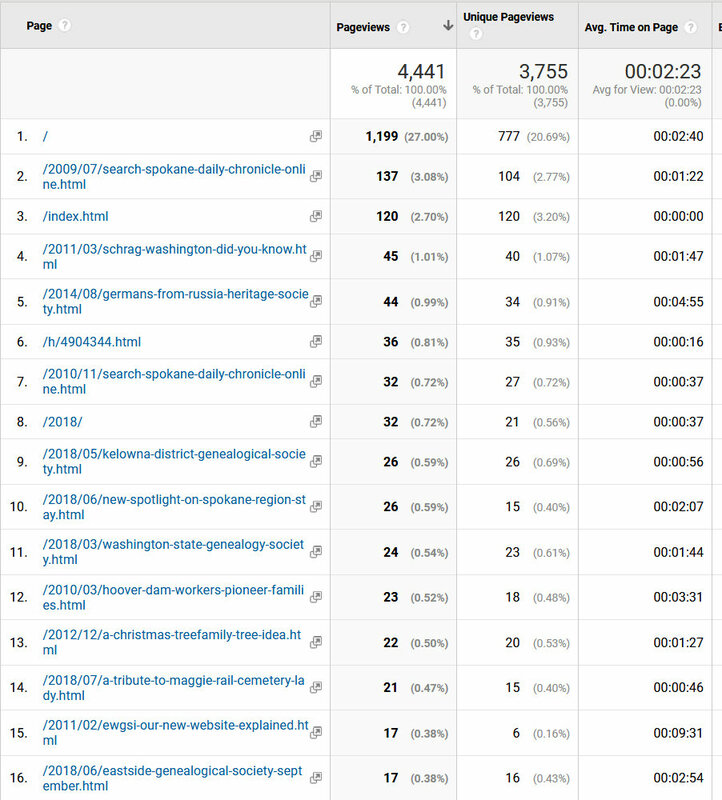 Well it has been an interesting year for the EWGS Blog. 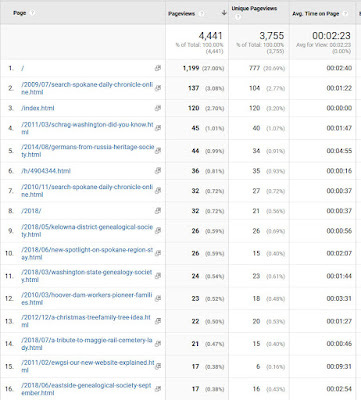 It was almost dormant for a while but Kris Krell has been writing some interesting blog posts. 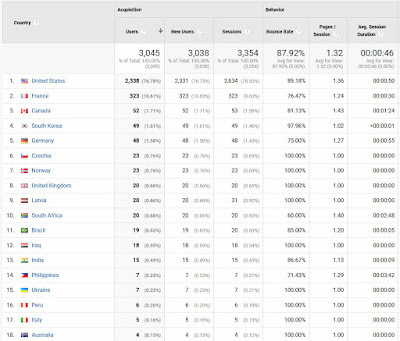 We do have people from many countries that read this blog. 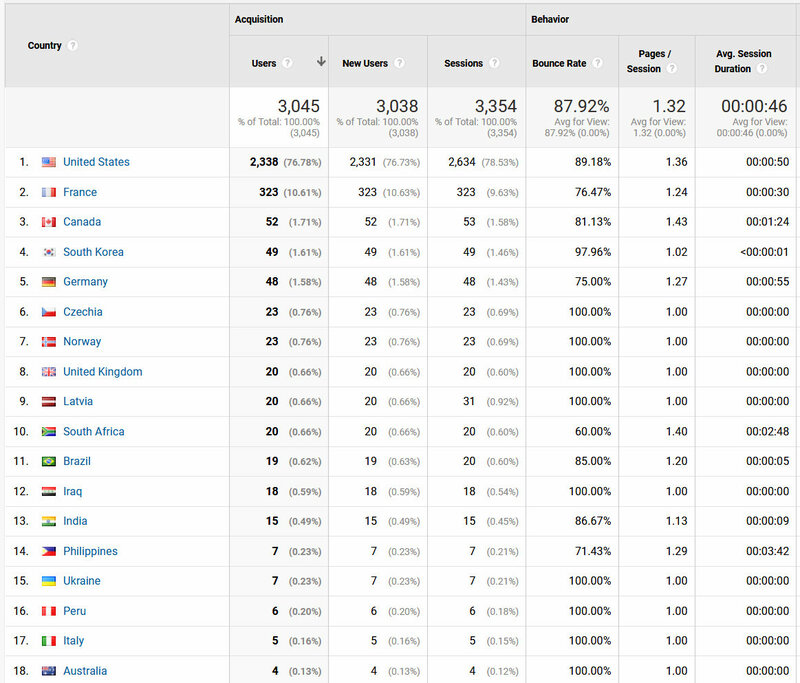 The readers from France mainly are checking to see if we are following the European Union guidelines for privacy. Click on the databases to make them larger. 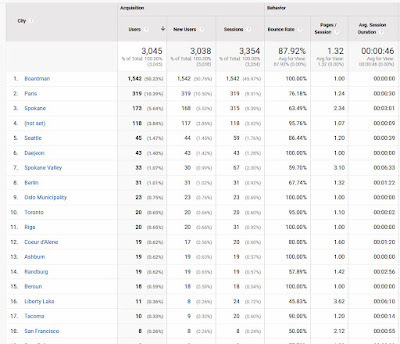 We have readers in many cities also. 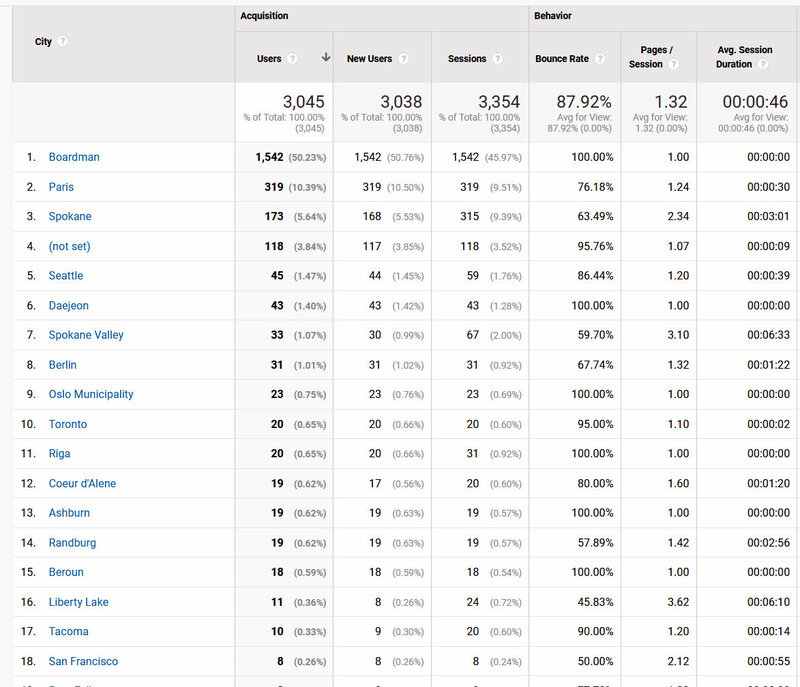 I never did figure out why so many hits from Boardman Oregon. Paris is where they were checking up on us from Europe. 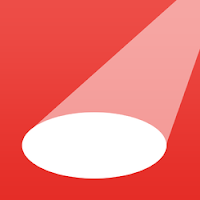 Last is the list of most popular articles from January 1 to December 28, 2018 from Google. Interesting that two of the most popular articles are from people still looking for how to search the Spokane Chronicle on Google News even though Google has shut off the search function. Only one of the articles from Kris Krell show up in this list, her first article from back in June. Did you know that Spokane had a Chinatown from the early 1800s to the 1970s? Spokane’s Chinatown spread over three or four blocks in the alleys near Trent Avenue. Chinatown’s boundaries east and west were roughly between Howard Street and Bernard Street, and north and south, between Front Avenue and Main Avenue. Front Street was near where Spokane Falls Boulevard is today. Chinatown was known by its nicknames Trent Alley and then also Japanese Alley by 1910. In the early 1800s immigrants came to Spokane from all over the world to work in the local railroad and mining industries. An anti-Chinese/Japanese prejudice in many of America’s cities and towns during that time caused the Chinese and Japanese residents to live and work in Chinatown. Chinese and Japanese markets, laundries, restaurants and hotels were nestled in these alleys. Chinatown was a thriving area. Spokane’s white majority considered Chinatown an exotic location, and they were also attracted to the illicit businesses such as gambling, opium dens, and houses of prostitution. Chinatown began about 1883 in Spokane. Before the great Spokane fire of 1889 the population was about 600; many businesses were lost in Chinatown in the fire. In 1882, the Chinese Exclusion Act was put into law that stopped Chinese people from immigrating to the United States, and the law denied recently arrived Chinese the right to citizenship. The ban was renewed in 1904 and finally repealed in 1943. During the years of the Chinese Exclusion Act, Chinatown’s population declined. Then in the early years of the 20thcentury, it was illegal for Chinese laborers wives to immigrate to the United States, so eventually Chinatown in Spokane was populated by only men. By 1910, Japanese families had moved into the Chinatown area; the population was now about 1,000 residents. 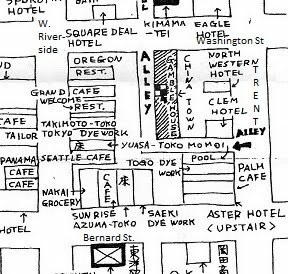 The Japanese opened restaurants, laundries, hotels, fish markets, barbershops, and pool halls. Chinatown, now called Japanese Alley, was thriving again. By 1935, the Depression had taken its toll; many Japanese returned to Japan. The Japanese population had declined to 385. After WWII, Spokane’s Chinatown population grew again. Spokane became a refuge for Japanese trying to avoid being sent to Internment camps on the West Coast. Spokane was outside the evacuation zone! After the war, those residents still living in Chinatown moved out and into the Spokane population. By 1974, Chinatown was deserted, and the buildings that were still standing were demolished to make way for Expo ’74. Where Trent Alley, Chinatown, was is now covered with parking lots, the convention center, and businesses. When I was growing up in South Dakota and Iowa in the 1950s and 1960s, we sometimes travelled Christmas morning to celebrate Christmas with my mom’s family in Meckling, South Dakota—just about an hour’s drive from home. Sometimes my adult brothers’ and their wives and children lived in the town where we were living, so we stayed home and celebrated with them. Somewhere along the way, when I was in fourth grade, and we were living in Sioux Falls, South Dakota, for the first time, we celebrated at home on Christmas Eve and in the morning travelled to Meckling. That was kind of farsighted on my parents’ part because our next move later that year took us from Sioux Falls to Salt Lake City, Utah. We were back to celebrating just with mom, dad, and my two sister’s that were three years younger and three years older than me. Four years later when we moved to Rapid City, South Dakota, we continued to celebrate by ourselves as the nearest family was about 6 hours away. We still celebrate on Christmas Eve with my older brother and sister, my younger sister, her husband and their three sons (my nephews) and now their wives, their children, and their wives’ parents. Our gatherings have doubled in size but the more the merrier, right? The first documented Christmas celebration in Spokane was downtown in 1874. Five families with eight children combined their resources and wanted to have for their children the most elaborate Christmas and New Year’s celebrations they could manage. The families—the James Glovers, the Yeatons, the Henry Cowleys, the Swifts, and the Pooles prepared the two holiday dinners and purchased a Christmas tree. Another nostalgic recounting in 1924 of an 1878 Christmas memory was that of W.C. Gray, owner of the California House hotel. The Christmas celebration was held at the James Glover’s house, a five-room home; half logs and half wood. The weather was mild. Christmas carols were sung—Silent Night, When Shepherds Watched Their Flocks by Night, along with others. Mrs. Glover played the organ and treated guests with coffee, cake, and apples. In 1927, Frank M. Dallman, founder of the Spokane Review newspaper recollected about his first Christmas in Spokane in 1883. Frank believed that Christmas was very important to children. He said that very few stores in the area provided for Christmas—no trinkets, no books, or playthings for children. Dallam remembered that they found some nuts “that looked as though they came over on the Mayflower “ and a few pounds of stick candy. Dallman’s wife made some cloth dolls for gifts. When Christmas morning arrived that 1883, the children rushed for their stockings and everyone was happy because their wants were few and it was easy to provide for those wants. Just a side note relating to a more current Spokane Christmas holiday, the Crescent Christmas windows are back after being in storage for 30 years! Six windows at the Spokane Grand Hotel are filled with the animatronic characters that were so popular from the 1950s to the 1980s. The windows will be on display until January 2, 2018. Ordained April 15, 1897, at the Hillyard Congregational Church, Rosine Edwards Stuart is thought to be Spokane’s first woman minister. Rosine had been a teacher, but she decided to prepare for the ministry so she could help her father in his circuit-rider missionary/ministry career. During his career he estabised more than a dozen churches in the Inland Northwest. Her father also wrote History of Spokane, a three volume work published in 1900. Rosine was born February 22,1873, in Plymouth, Pennsylvania. She came to Spokane in 1885 when her father became pastor of First Congregational Church (now Westminster Congregational United Church of Christ at 4thand Washington). Rosine graduated from Spokane Falls High School having studied English grammar, physical geography, penmanship, reading, and United States history. She then graduated from Whitman College in Walla Walla, Washington, in 1895, and also studied at Pacific Theological Seminary in California. At Rosine’s ordination, Whitman College President, Dr. Penrose, gave the sermon. Rosine’s father, Dr. Edwards, and Reverend Elvira Cobleigh from the coast–the only other woman pastor in the area, both participated. A front-page Spokesman-Review article in May 1897 said “Spokane Girl Returns to City as a Licensed Preacher. An example from one of Rosine’s books pointed out that it is only by the highest development of self that we are enabled to give the best to others. Rosine was the principal of a girls’ academay near Yakima, Washington, for two years prior to her marriage to Malcom Roy Stuart in 1902. Rosine also serviced a church at Tolt, Washington, prior to working at the girls’ school. Rosine and her husband Roy moved from Tolt, Washington, to Spokane were Roy worked at a dairy. They had one son and two daughters. Rosine retired from the ministry after her marriage, but she remained active in church and missionary groupings in Washington and Oregon. She was frequently called to preach and fill various pastorates. Rosine lived in the Spokane area for thirty-two years and then moved to Portland, Oregon, where she died on March 24, 1941, at age sixty-eight years from a heart disorder. Hi! This is a resend of this morning's post. Many thanks to an alert, careful reader for letting me know that I mistyped the year 1925 instead of 1825 in two places in the blog. The first mistype was in the second paragraph second sentence; the second mistype was in the last source in the footnotes. I have corrected both of the dates below. I also added another source that I used. The mistypes are confusing to the reader, so I decided I should send out this post notifying you of the correct year. Colville, Washington, county seat of Stevens County, about 65 miles north of Spokane and approximately 45 miles south of the Canadian border, was incorporated in 1890 but was founded some years earlier. 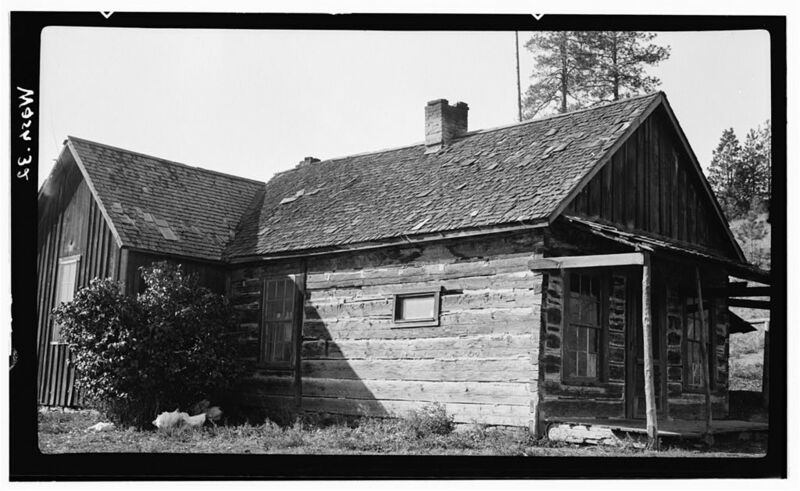 This frontier town, named Pinkney City, began in 1859 as it was located next to the military Fort Colville. Fort Colville was started in 1825 by the British Hudson Bay Company (HBC) when the HBC moved its fur-trading post from the Spokane House to this new location. The HBC spelling was Colvile. Pinkney provided for the needs of the fort and the surrounding territory. Pinkney City was named after Captain (later major) Pinkney Lugenbeel (also sometimes spelled Lougenbeel) (1819-1886), the first commander at the fort. The Colville River Valley region where Pinkney City was located was in a fertile land area, and the homesteaders there raised cattle and horses, planted and harvested wheat and other crops, and engaged in logging. Around 1859, a post office came to serve the fort as well as the surrounding area. By this time, Pinkney had become the county seat, and Pinkney City was renamed Fort Colville, so that the post office and the county seat would have the same name. Fort Colville closed in 1882. After the closure, Pinkney City began to decline, so, people, businesses and even some buildings relocated to and established Colville named after the unoccupied fort. Colville was platted February 28, 1883. “the home of the Stevens County Historical Society Museum. The Keller House, also includes a machinery museum, a home-stead cabin, and a Forest Service fire lookout are among the many buildings on display on over seven acres of a pristine park-like setting. The museum houses a very extensive collection of native American artifacts of tribes from all parts of the nation as well as all local tribes. The rest of the building is filled with remnants of days gone by and contains several well-organized displays of life as it was in the younger years of Stevens County. Also included in various displays are discussions of local history, dating from the 1811 visit of David Thompson to the area through the era of both Fort Colville and Pinkney City to the present day. Colville’s 1959 centennial celebration organizers date Colville’s beginnings from the founding of Pinkney. By that thinking, Colville is the second oldest town east of the Cascades exceeded only by Walla Walla. Sources: HistoryLink.org: Colville-Thumbnail History, 2010, HistoryLink.org: Fort Colville (Hudson’s Bay Company), 1825-1871, 2009, City of Colville, The Stevens County Historical Society Museum. Did you know that Spokane had numerous trolleys running routes in Spokane in the 1880s? Did you think public transportation would have been an issue way back then? Did you know that Spokane had buses in the 1920s? A Streetcar or Trolley runs on rails but the power comes from onboard electric motors and the trolley pole sticking out of the top of the streetcar attached to power line above. Spokane’s trolley era began April 15, 1888, and ended August 31, 1936. The heyday of Spokane’s trolleys was around 1910 when at least 150 trolley cars clanked down city streets—Washington Water Power’s (WWP) trolley line’s ridership was recorded as 24 million riders in 1910! Real estate developers were the first to develop trolleys in Spokane. Developers wanted people to buy houses outside of the downtown area, but the buyers needed to know that they could get to work using public transportation. This was true for both working-class neighborhoods because everyone could ride a trolley to work, as well as upper-class neighborhoods because their servants, maids, cooks needed to use public transportation to get to work. 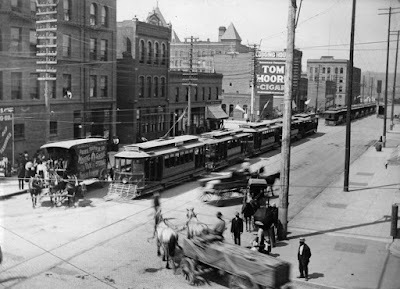 · April 15, 1888- Spokane’s first streetcar by Spokane Street Railway was horse-drawn were the first developed; their route was Riverside Avenue to Brown’s Addition. Cons: messy streets from the horses. · June 1888– Spokane’s first cable car line (not a streetcar or trolley)—Spokane Cable Car Company--had one route heading toward Fort Wright, and another route heading up toward a new South Hill development called Cable Addition. This company built the first Monroe Street Bridge for its cable line. Cons: Very expensive. Streets had to be dug up to lay cable. When the cable went out, every car stopped. · November 1888– Spokane’s first steam-powered line by Spokane and Montrose began operation on the South Hill. The streetcars were called Steam Dummies. The Montrose reference was to an undeveloped potential park to be called Montrose Park but was eventually developed and became Manito Park. Cons: Noisy, frightened horses, blew soot over pedestrians, had to build up a head of steam before could move trolley. · 1889– The first electric trolley line begins in the East Central area. · 1889– The horse-drawn lines immediately begin changing over to electricity. · 1891– The remaining horse-drawn lines complete conversion to electricity. · 1892– The steam-powered lines convert to electricity. Competition between the companies was fierce. WWP—in 1899--bought up all of the smaller trolley lines except one. By 1910, WWP and the Spokane and Montrose each had 12 lines all around the area. People could ride the Trolley to work, to baseball games, to vaudeville shows, to Natatorium Park. Often high school students when riding a streetcar would rock the cars to get them off the tracks! Then everyone had to wait until someone could come and put the car back on the tracks. "Imagine speeding down the street at the amazing speed of ten miles per hour. Gliding up hills effortlessly and traveling in style to all the corners of Spokane Falls for only a nickel." These days we may not think that ten miles per hour is very fast, but when that ad was written it was pretty fast! By 1915, the trolley era was already declining. Cars were more common. By the 1920s buses were becoming the new public transportation—they were faster and cheaper. Spokane’s trolley lines consolidated in 1922 renamed to Spokane United Railways; by 1933, they saw the future in buses and began to convert; the conversion to buses was completed in three years. On August 23, 1936, all of the trolleys were burned in a huge bonfire! On July 2, 1886, the newly built hospital was awaiting the blessing of its cornerstones. Community members and a group of Catholic priests and sisters had gathered for the blessing. Also in attendance were Mother Joseph, Sister Joseph of Arimathea as well as Aegidius Junger, the Bishop of Nisqually. While the Bishop was giving the blessing, he asked Mother Joseph for the name of the hospital. 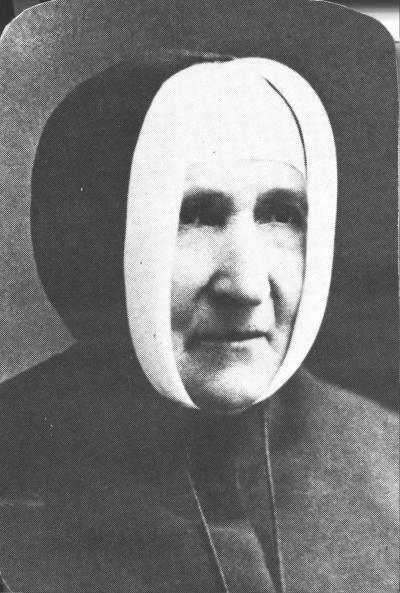 Mother Joseph was speechless--the superior of the Sisters of Providence in Montreal had not provided the hospital’s name. Assistant priest, Aloysius Ragaru, SJ, said, “Sacred Heart Hospital.” Ragaru either remembered that July 2 was the day of the Feast of the Sacred Heart, or that Mother Joseph’s full name was Mother Joseph of the Sacred Heart. · April 30, 1886, Mother Joseph left Vancouver, Washington, for Spokane, WA. · May, 14, 1886, Sisters in Montreal, Canada, agree to build a hospital. · July 2, 1886, Blessing of the Cornerstone and naming of hospital. 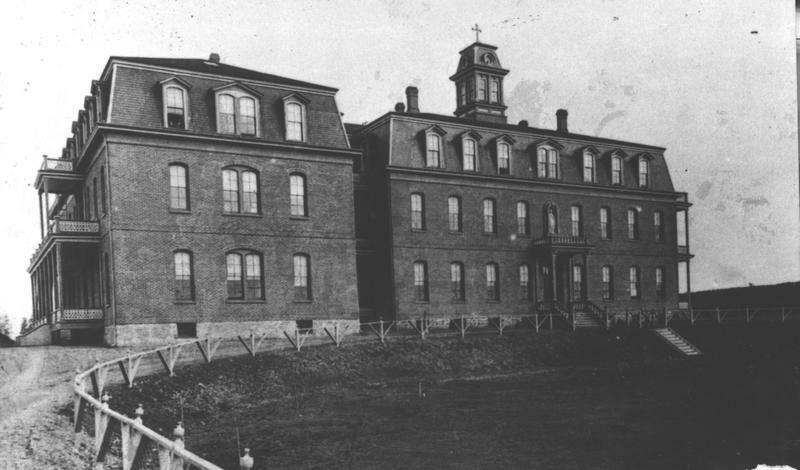 · January 27, 1887, Sacred Heart Hospital officially opens. · February 14, 1887, The county awards the Sisters a contract to care for the poor. Contract rate is $1 per day. · 1888, 579 total patients seen. · 1889, Additional wing opens. accommodate three operations per day. · 1892, Electric lights replace oil lamps. · 1893, First obstetrical patient delivers a baby at Sacred Heart. · 1898, Nurses Training School opens—first in Spokane and second in the state. · 1899, Doctors pay $375 for the first X-ray machine. · 1900, First class of nurses graduate from the School of Nursing. Mother Joseph of the Sacred Heart and four companion sisters were sent from the Motherhouse of the Sisters of Providence in Montreal to Ft. Vancouver, Washington Territory where they arrived on December 8, 1856. They were sent to Spokane to serve the unmet needs especially among the poor. Thus began the legacy of the Sisters of Providence in establishing health care, educational and social ministries for people in the Northwestern and coastal regions of the United States and Canada. Mother Joseph, at the request of Fr. Joseph Cataldo, SJ, designed and supervised the 1886 construction of a “refuge for the homeless, poor and dying,” the area’s first hospital, built in the frontier town of Spokane Falls. At the time, Sacred Heart Hospital was a 31-bed facility built along the Spokane River where the Spokane Convention Center stands today. Mother Joseph established 29 hospitals (this includes Spokane Sacred Heart Hospital), schools, orphanages, and care centers to care for the sick, poor, aged, homeless, and children. By 1910, the hospital had grown so quickly that a new hospital was needed. Horse-drawn wagons carried the hospital’s contents and patients to their new South Hill site—which remains the current site today. The South Hill at the time was said to be “out of town.” The new hospital had 240 rooms and could handle 1000 patients, it also had a maternity ward and nursery—women are now birthing in hospitals instead of at home. 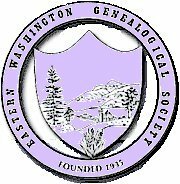 Just a quick reminder, for any EWGS members that are interested, Family History Fanatics is conducting an online DNA eWorkshop: After the Test the evenings of Nov 29, Dec 6, and Dec 13. Participants will learn about what they can do with their DNA results after the test and how to start using this powerful genealogical tool. Six hours of interactive instruction for the early bird price is $24.99 through November 18th and $29.99 thereafter. More details and registration can be found at: https://www.familyhistoryfanatics.com/dnaworkshop. Feel free to let any of your friends or family know about this workshop. So how did the Looff Carousel find its home in Spokane, Washington? Washington Water Power Company (WWP), wanted to promote trolleys so they opened Twickenham Park in 1893 (later to become Natatorium Park) with their partner Spokane Street Railway. The Ingersoll Amusement Company, who operated the park for owners WWP, commissioned the carrousel in 1907 with no money down. Looff also designed and built the famous Coney Island carousel. Ingersoll and Looff had a deal for WWP to buy the carousel for the park. Looff built the carousel in his Rhode Island workshop, but before it was completed, WWP had to revoke the deal as The Ingersoll Amusement Company had gone bankrupt because of the Panic of 1907, and WWP was burdened with debt because of the Ingersol bankruptcy, Neither could afford the $20,000 cost of building and shipping of the carousel, so Looff shipped it to Spokane in pieces in 1909, and gave it to his daughter, Emma Vogel, and her husband, Louis Vogel, as a wedding gift. The carousel sat in crates in the railway yards for months. Looff’s daughter, Emma, had recently moved to Spokane with her husband, a banker. Charles Looff told WWP that he would cancel the $20,000 debt and release the carousel if WWP would make the Vogels the park’s concessionaires. WWP liked this arrangement, and the park opened July 18, 1909, with the Looff Carrousel as the Park’s newest attraction. The Vogels purchased Natatorium Park in 1929. The Carrousel featured 54 beautifully unique carved and painted horses, two “chariot-benches”, a giraffe, a goat, a tiger--which according to Bette Largent, the artist in charge of restoring and maintaining the carrousel--is very rare. Largent calls the tiger “sneaky” because the head is looking down. As of 2009, there were only three of these “sneakys” remaining. 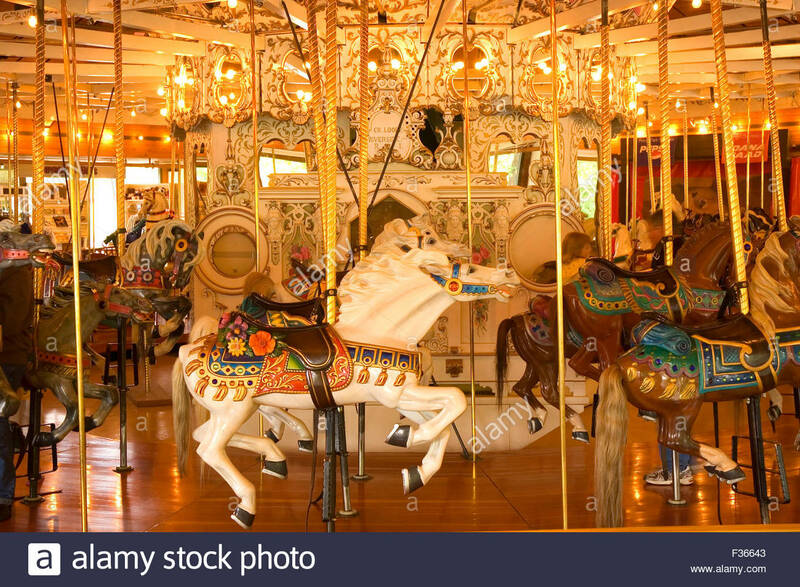 The Carrousel also had a state-of-the-art German “band organ” by Ruth and Sons, with 300 pipes, manufactured in Waldkirch, Germany and imported by Looff around 1900. The organ is similar to a player piano as it played music automatically using folded book music. Every year a new music book arrived with the most current tunes. A March 14, 2016, article, “Collector donates an early Looff horse to Spokane’s Carrousel”, by The Spokesman Review, discusses Jack, a horse who was most likely carved in 1886—which would make Jack about 20 years older than Spokane’s 1909 Carrousel. Jack is a fixed-in-place prancing horse built for the inside ring of a carousel. They know that Jack is an early carving by Looff because of the carving of the front leg muscles. Jack was on at least three other carousels at Coney Island and Feltman’s Pavilion in New York’s entertainment destination. As of this newspaper article above, Jack was valued at between $7,500 and $8,500. The outside ring of horses are called “jumpers” and most everybody wanted an outside horse. When technology was developed to make the animals on the inside ring move up and down, that development was made to attract riders to the inside ring.